What is the NBN phone? Still getting your head around the National Broadband Network? Don’t worry, it’s quite complicated. However, once the NBN finally rolls down your street and the time comes to make the switch, your phone service will also come via the NBN, as Australia seeks to phase out the existing copper phone services we use today. We’ll also look at what happens if you want to keep your existing phone number and other relevant information. The NBN is replacing most of the traditional landline networks for phone and internet services. The Fibre Phone (the new NBN phone service) has been introduced as a new way to make phone calls as a result. It allows you to make phone calls over your NBN connection. It combines the features of a traditional landline phone service with the cost-effective call charges that your service provider offers. The NBN has essentially been implemented to phase out the existing copper phone service, and it is more advanced as a result. It comes with all the features that modern consumers expect from a phone, complete with voicemail, call waiting, 3-way chats, caller ID and more, which a lot of modern home phones still don’t have. How does the NBN phone work? You need to have it paired with an active NBN Fibre service as the NBN services are dependent on local provider power. If your fibre plan is cancelled, your phone service will also be cancelled. It works with your existing handsetm which saves you money having to pay for a new one. It has all of the features you can expect from a phone including voicemail, call waiting, 3-way chat, caller ID and more. Moving to the NBN network is not automatic, and as a result you will need to arrange to have your phone and internet services moved to the NBN network before the advised date. Your service provider will be able to advise you on how to do this. In general terms, the NBN phone service is a Fibre-to-the-home (FTTH) system, where super-fast fibre optic cable carries the signal from your provider to your home. This system is so much faster than the copper wire system because it uses light to transmit data, rather than electric impulses. The copper method is much cheaper to implement, but the NBN FTTH system is significantly faster and requires much less maintenance, so it is the better option in the long-run. Seeing as the phone service is delivered via the NBN, it has the ability to work in a power outage if a battery backup is installed with your NBN phone service (this can be installed at no extra cost when you apply for NBN Fibre with iiNet). If you make a lot of international calls, you can factor this into your NBN Phone package and get cheaper rates. For example, iiNet allows you to add an International Call Pack ($10 per month) to your Fibre phone service. With the NBN phone service, expect set-up costs and other fees. Many providers offer to bundle in a phone service with an internet plan, and this may work out to be better value. Below are some of the rates indictating how much you can expect to pay. Some providers have a minimum charge, with which you stand to receive some unlimited calls, whereas others simply provide pay as you go (PAYG) calls. Keep in mind these may be rates for a standalone phone service; it may work out to be cheaper to bundle with an NBN plan. When the NBN is available in your area, you can firstly order an NBN Broadband service of your choosing. A technician will install an NBN Network Termination Device at your premises. You can keep using your existing phone and broadband while this takes place. If you have each of these things, then actually installing your NBN fibre phone is as easy as plugging your handset into the UNI-V on the NBN connection box using the phone cable. It’s a little more complicated if you have internal network wiring. If this is the case, then you need to plug one end of the phone cable into the UNI-V port and another into the available phone port on the nearby panel. Below is how iiNet explains. 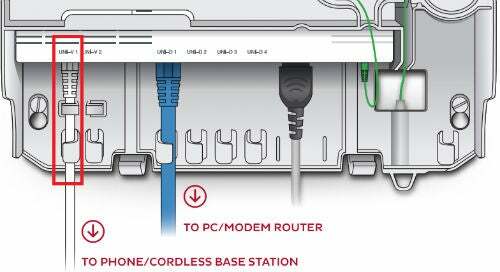 If this all seems too complicated, then don’t hesitate to contact an NBN installation contractor. You can request that you current number is ported to the Fibre Phone. This will cancel the current phone line and stop your ADSL phone from working. This is why you should do it after your NBN Network Termination Device is up and running. Keeping your current number and service provider can obviously save a lot of stress and effort, so make sure you contact your NBN and service provider to ensure that this is the case. You are responsible for maintaining and replacing your NBN backup battery. Maintaining the battery of your NBN fibre phone is important as they are the only phone service in Australia that can operate during a power outage. During an outage, the battery will provide power for a limited period of time (about 3-11 hours fully charged). This will be less if the battery is not kept charged, and calls to 000 services in the case of an emergency are not guaranteed if you don’t do so.